Whenever I’m in Etosha during the dry season I always make it a point to spend some time at the Okaukuejo waterhole. There is a lot to be seen whether it is day or night, but the nights are especially interesting because of the possibility of seeing a rare black rhinoceros. I had my cameras set up on tripods and I was watching a small herd of giraffe making their way to water. Giraffes are nervous drinkers and can take hours to come to water even if they are only a few hundred meters from it. They will watch, take a step, watch, run away, stop, turn around and repeat the cycle several times. It can be a painfully long amount of time. And when they are finally near the water, they will drink quickly and run. They don’t mess about, the giraffes. It’s interesting to watch them be so nervous, and I’m not sure if this happens with giraffes everywhere, or only in places with lions. Giraffes are arid adapted animals and can survive with little or no water. That day, there was no water on the menu. They ran! There were lions around. In the trees not too far from the waterhole, lions roared. From the direction of the calls, a large figure waded over the rocks as it moved toward the water. Lion? No. Rhino! A large adult rhino in its prime has no natural predators, except for desperate lions perhaps, but I had never seen a rhino with a lions calling in the background before, so I did not know how rhinos and lions interact. This animal calmly moved towards the water, ignoring the lions which probably meant that it wasn’t bothered by the presence of the lions. When the rhino was within the reach of the lights at the waterhole, a smaller figure, that looked very rhinoceros-like in silhouette but unusually agile, was seen running in the darkness. Young rhino? With lions around? No. It was a young zebra foal. It ran straight to the bulky rhinoceros, which spooked and snorted at the poor animal. The young foal ignored the rhino’s threats and went even closer to its unhappy odd-toed relative. It was very dark, but I managed to get a photograph of the two animals side-by-side, until the foal finally decided that the rhino was no friend or protector and went straight into the middle of the waterhole. It suddenly dawned upon me that there were no other zebra around. No zebra calls and no zebra hooves clashing with the countless rocks in the area! Suddenly, the lions roared again! The calls came from the direction from which the little zebra was seen running from. I try not attach human emotions when watching wildlife, but this situation made me instantly sad as soon as I realized the situation the young and helpless foal was in. I went weak and couldn’t take another photograph. The lions had perhaps got the young foal’s mother — a vain sacrifice from a zebra mare to save its offspring. Why the zebra foal wanted to tag along with a rhino, I will never know. Did it look like its mother? Smelled like its mother? It had perhaps seen other rhinos at water before, drinking with its herd? The zebra foal had no chance of survival. It was just too young and too alone. Hyenas now started calling. I packed my cameras as I couldn’t stay and didn’t want to see, or hear what would happen next. Human emotion had overcome any interesting observation or photographs I may have had a chance to make. The rhino, now satiated with water, started moving back into the darkness of the night, in the direction of the calling hyenas. 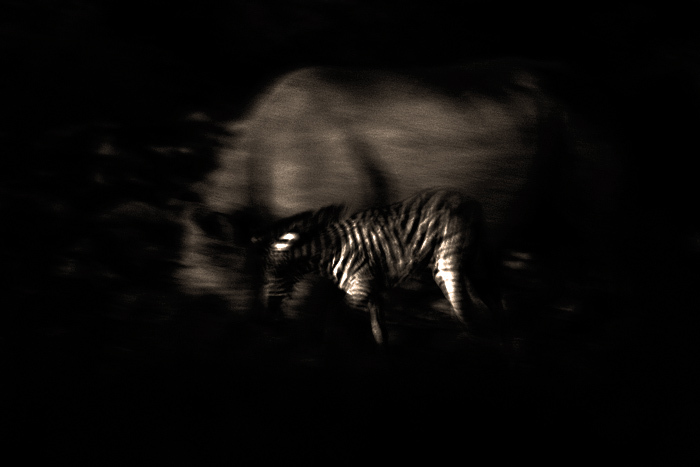 The zebra foal followed the rhino into the darkness. What happened after I will not know, but I don’t think the foal saw light of day again.